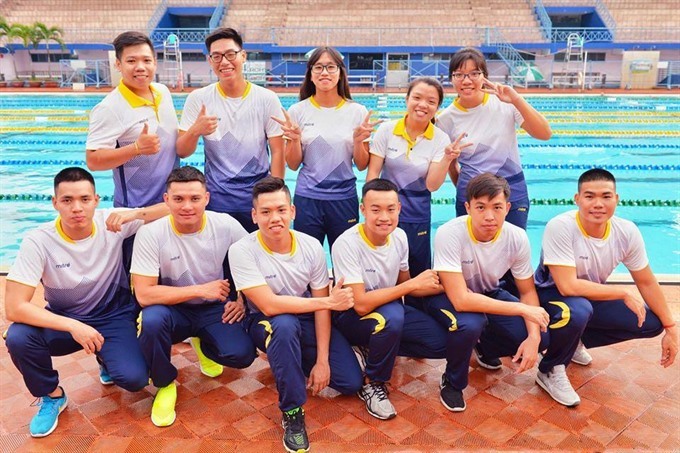 HÀ NỘI — Following two days of competitions, Vietnamese athletes have won five gold, one silver and three bronze medals and set a new record at the 16th Asian Finswimming Championships in Yantai City, China. Nguyễn Thành Lộc secured two titles at the seven-day competition. He first won the men’s 200m surface with a time of 1min 21.39sec – a new Asian record. Lộc left behind Jang Seonghyeok and Park Jaeho, both of South Korea. He then triumphed in the 100m surface category with a time of 35.28sec. Trần Thị Trang Diễm claimed her gold in the women’s 1,500m surface event with a time of 1:46.03. Lưu Nguyễn Đức Tâm, meanwhile, bagged the men’s 1,500m surface title, clocking 1:37.60. The Asian Junior Finswimming Competition has also been organised at the same time and same venue. The young Vietnamese athletes have won three golds, two silvers and three bronze medals. The winners are Nguyễn Duy Anh with a double in the men’s 100m and 200m surface and Cao Thị Duyên in the women’s 100m bi-fins. The two silvers went to the mixed groups of 4x50m surface and 4x100m bi-fins. Trần Trung Thành brought home two bronze medals in the men’s 100m and 200m bi-fins, while Lê Hoàng Nam Thuyên was third in the women’s 200m bi-fins.